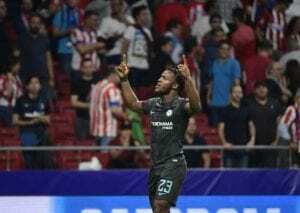 Michy Batshuayi struck a dramatic winner with the last kick of the game as Chelsea inflicted Atletico Madrid’s first defeat at their new Wanda Metropolitano home on Wednesday with a hugely impressive 2-1 Champions League victory. Substitute Batshuayi’s late intervention was just rewards for a dominant Chelsea display despite falling behind to Antoine Griezmann’s penalty five minutes before half-time. Former Real Madrid striker Alvaro Morata came back to haunt Atletico on his return to the Spanish capital by nodding home Eden Hazard’s tempting cross on the hour mark. And Batshuayi finished off a patient team move deep into stoppage time by turning home Marcos Alonso’s cross at the near post. “We have the kind of player in the team to do something: Alvaro, me, Michy, Willian,” Hazard told BT Sport. Victory ensured Chelsea take a commanding lead at the top of Group C with six points from their opening two games ahead of Roma, who moved onto four with a 2-1 win at Azerbaijani Champions League newcomers Qarabagearlier in the day. “We are very confident, trust me. Atletico are very good,” added Hazard. Despite the Brazilian-born striker’s refusal to train with the Premier League champions this season it was all smiles as he greeted plenty of his former teammates in the tunnel before kick-off. However, Chelsea haven’t missed Costa so far this season as his replacement Morata has now scored seven goals in as many games. Morata, though, hadn’t scored in six previous appearances against Atletico for Juventus and Real and passed up a series of early chances as Chelsea dominated. Twice the Spanish international pulled shots wide after excellent build-up play from the outstanding Hazard. Morata then finally forced Jan Oblak into a save as the Slovenian tipped his looping header over for a corner. Chelsea’s control forced Atletico boss Diego Simeone into a tactical reshuffle as he switched from his favoured 4-4-2 to 4-3-3 and was rewarded as the hosts stemmed the Chelsea tide. David Luiz snuffed out Juanfran’s dangerous cross for Griezmann in Atletico’s first real attack 10 minutes before half-time. However, the Brazilian was then at fault for Atletico’s opener as he was penalised for hauling down Angel Correa from a corner. Griezmann kept his cool to smash the penalty past a former Atletico favourite Thibaut Courtois for his third goal in as many games at Atletico’s new home. And for all Chelsea’s pressure, Atletico could easily have been two up at the break as Courtois parried Koke’s fierce drive and Saul Niguez fired the rebound inches wide with the final kick of the half. But it took until the hour mark to level when Morata continued his scoring streak with his head with a flicked finish from Hazard’s pinpoint delivery.